Ridiculously fun, well thought out, smart, spooky escape room! We made it out in the nick of time but it was certainly an amazing challenge. We did the Haunted Hotel but I’ll def go back to do the Prison room! This seemed like a cozy little hotel when you arrived here yesterday. Tired, you went to sleep as soon as your head hit the pillow. Suddenly, in the middle of the night, you jolt awake. Is there someone here? Was that the wind playing, or the door creaking open? 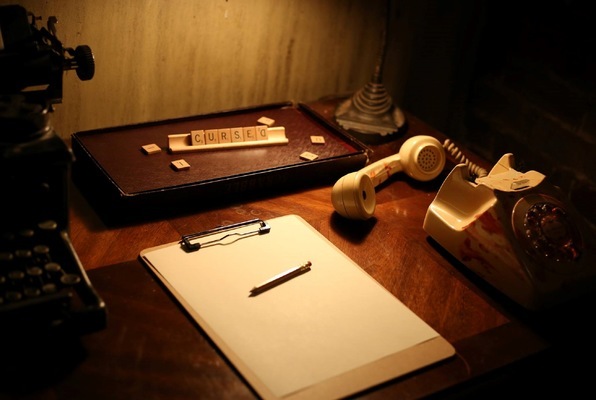 Reviews of escape game "The Haunted Hotel"
Very well organized and executed. Truly haunted. Had an awesome time, even though we did not escape. Had a wonderful time at this place. It was a very immersive experience and the set was the perfect amount of creepy, fun and interesting. I highly recommend it! Wonderful experience overall. We did the Haunted Hotel and the atmosphere was so well done and the puzzles were challenging but fun. Would definitely recommend people to go and it’s a great price! We tried to escape from the Haunted Hotel (group of 8). It was creepy, fun, challenging and infuriating (but in a good way!) Wish I had brought my "readers" though! Clues were helpful and well-timed and it was a great way to spend an hour that kept us talking all night. Highly recommend (also a great neighborhood with tons to do afterward) It was REALLY hard! So much fun! Super intricate rooms and everything was so authentic and well put together ! The staff was super courteous and made it all the more fun, I would definitely do it again and I recommend everyone to go try it! Got to be one of the first teams to do Brainxcape's Escape the haunted hotel game and it was such a blast! SO much fun and had a great time doing it with my friends! I highly recommend. The decor in the room was so awesome. We just missed escaping by like 45 seconds, but will definitely go back and do the prison and I know we will escape this time!! !